1. Department of Liver Surgery, Renji Hospital, School of Medicine, Shanghai Jiao Tong University, Shanghai 200127, China. 2. International Cooperation Laboratory on Signal Transduction, Eastern Hepatobiliary Surgery Institute, Second Military Medical University, Shanghai 200438, China. 3. National Center for Liver Cancer, Shanghai 201805, China. 4. Department of Biliary and Pancreatic Surgery, Shanghai East Hospital, School of Medicine, Tongji University, Shanghai 200120, China. 5. Department of Interventional Oncology, Renji Hospital, School of Medicine, Shanghai Jiao Tong University, Shanghai, China. 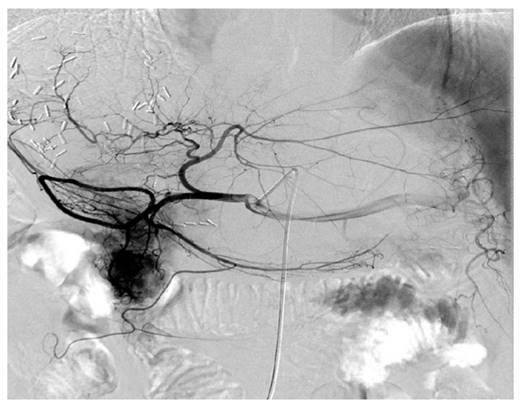 Background: There is no information regarding transarterial chemoembolization (TACE) as a postoperative management after hepatic resection for patients with hepatitis B virus (HBV)-associated intrahepatic cholangiocarcinoma (ICC). Methods: Forty-two patients with pathological confirmation of HBV-associated ICC were enrolled. Prognostic impact of the clinicopathological factors as well as postoperative TACE were evaluated. 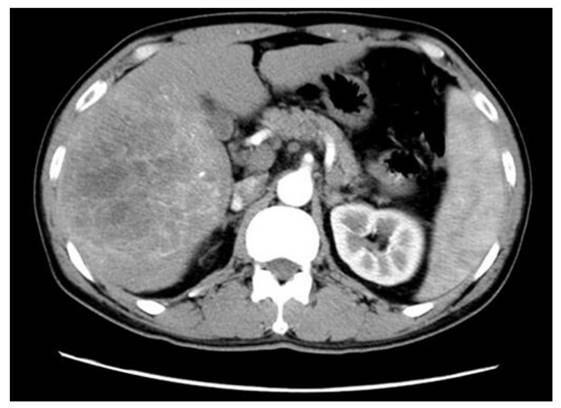 Computed tomography findings of HBV-associated ICC were assessed. Results: Tumor size of larger than 5 cm (hazard ratio [HR], 5.654; 95% confidence interval [CI], 1.175 to 27.204; P = 0.031), postoperative TACE (HR, 0.123; 95% CI, 0.023 to 0.643; P = 0.013), and lymph node metastasis (HR, 3.284; 95% CI, 1.236 to 8.724; P = 0.017) revealed to be independently associated with survival outcomes of patients with HBV-associated ICC. Application of TACE, as a postoperative management to control early local recurrence on the basis of hepatic arterial phase enhancement, significantly prolonged survival outcomes (1-yr, 88.9%; 3-yr, 77.8%; 5-yr, 66.7%), compared to the patients who did not receive TACE (1-yr, 63.6%; 3-yr, 30.8%; 5-yr, 13.0%). When analyzed according to the status of hepatic arterial phase, arterial phase enhancement demonstrated a favorable trend on prognosis of patients with HBV-associated ICC without statistical significance (HR, 0.435; 95% CI, 0.140 to 1.359; P = 0.141), and TACE independently improved overall survival of patients with arterial phase enhancement (HR, 0.105; 95% CI, 0.014 to 0.774; P = 0.027). Conclusions: Put together, our results indicate that postoperative TACE effectively improves prognosis of HBV-associated ICC with arterial phase enhancement in CT scans. Large-sized trials are required for our results to be applied in clinical medicine. Intrahepatic cholangiocarcinoma (ICC) is the second most frequent hepatic malignancy that approximately accounts for 10% of primary liver cancers after hepatocellular carcinoma . Although advances in the diagnostic approaches have been made, degree of preciseness in diagnosing ICC is yet to be implemented in clinical medicine due to absence of sensitive biomarkers and untypical manifestations . Despite surgical advances in complete resection of the tumor, which remains to be the best opportunity for cure, previous studies evaluating prognosis of ICC reported particularly unfavorable survival outcomes, on account of biological characteristics of the tumor, including frequent nodal metastasis and strong invasiveness . According to our previous study and recent findings, HBV-associated ICC has been found to be a distinct entity with different clinicopathological and biological characteristics, such as younger aged, relatively infrequent incidence of lymph node metastasis, elevated serum aspartate transaminase and alpha fetoprotein (AFP), relatively lower level of serum carbohydrate antigen 19-9 (CA19-9), and prolonged survival outcomes . However, to our knowledge, there is no such therapeutic approach that is specifically indicated for this group of patients. Although some reports have noted relatively better prognosis of patients with ICC who received TACE after resection, the confirmation regarding whether TACE could improve survival outcomes in which group of patients with ICC has not been evaluated [5, 6]. Specifically, although TACE as a postoperative management for early recurrence of ICC shown to often provide a therapeutic benefit, not all of patients obtained improved survival outcomes . Therefore, it is important to stratify patients who might benefit from TACE. Herein, we evaluated prognostic impact of postoperative TACE in patients with HBV-associated ICC after hepatic resection. Unlike typical ICC, arterial phase enhancement (APE) at the computed tomography (CT) scan was commonly observed in patients with HBV-associated ICC, which led to the application of TACE as a postoperative management, and the performance of postoperative TACE significantly prolonged overall survival (OS). Taken together, our data suggest that ICC patients with hepatic APE, which is frequently observed in patients with HBV-associated ICC, at preoperative CT might be a highly selected population to benefit from TACE. From July 2011 to July 2015, a total of 42 patients with HBV-associated ICC underwent hepatic resection at the Department of Liver Surgery, Renji Hospital (Shanghai, China). The patients were included on the basis of the following criteria: (1) pathologically confirmed ICC, (2) single type of tumor, (3) seropositivity for hepatitis B surface antigen (HBsAg) or hepatitis B core antibody (HBcAb). The patient exclusion criteria for the present study included (1) mixed hepatocellular cholangiocarcinoma, (2) patients without HBV infection, (3) patients who received neoadjuvant therapy, (4) patients with distant metastasis at the time of surgery, (5) patients who died within 1 month after the surgery, and (6) patients who underwent liver transplantation due to misdiagnosis to hepatocellular carcinoma. This study was approved by the local ethics committee of Renji Hospital, School of Medicine, Shanghai Jiao Tong University. Written informed consents were obtained from all patients involved in the present study. Prospectively collected ICC database was reviewed for the description of clinicopathological characteristics. HBV infection was detected by seropositive for either HBsAg or HBcAb. Liver cirrhosis was diagnosed by Sirus Red staining of liver specimens. Preoperative level of alpha fetoprotein (AFP) and carbohydrate antigen 19-9 (CA19-9) represented results from the latest serological examinations within one week before surgery. Tumor size for each patient was collected during surgery and defined as a maximal diameter of the principal tumor nodule. Lymph node metastases and vascular invasions were diagnosed from the imaging studies preoperatively with contrast-enhanced CT and confirmed during the surgical operation. The Edmondson-Steiner criteria were applied for the description of histopathological grade . Follow-up was regularly performed at the section for outpatients. The patients without data from the section for outpatients were collected through telephone inquiry. Follow-up investigation was performed with a median of 36 months (IQR, 11 to 65). The endpoint of the study was the overall survival (OS). The follow-up investigation was carried out until Dec 2016. All surgical procedures were performed through laparotomy by experienced surgeons. Resection was indicated for patients with resectable ICC under conditions of adequate remaining liver volume and tolerability for general anesthesia, which was determined by specialists in hepatic surgery. All patients received hepatic resection with regional lymph node dissection. Surgical range for minor resection was defined as operating extent of 3 segments or less, whereas major resection included 4 segments or more. The indicative value for major resection was an indocyanine green clearance rate of less than 10% at 15 min. A 64-multidetector Discovery CT750HD scanner (GE Healthcare) was used in the performance of CT scans. The unenhanced scans were acquired through the liver. A 80 to 100 ml of nonionic iodinated contrast material (Iopamidol, Shanghai Bracco Sine Phamaceutical Co. Ltd., China) was injected at a rate of 4 ml/sec using a power injector according to the body weight (1.35 ml/kg). Arterial and venous phases of the liver were scanned after 35 seconds and 90 seconds after the infection, respectively. The images at delayed phase were detected at 2 min after the injection. The tumors in the arterial phase were assessed independently by two authors (S.J. and J.G.) for the enhancement characteristics. The assessment was carried out without access to the clinicopathological characteristics of the patients. The largest lesion was assessed in cases of multiple nodules. The arterial phase enhancement was determined according to the presence of hyperattenuation area, including both the peripheral margin and within the tumor, and the hyperattenuation area was evaluated by comparing the enhancement extent of the tumors to the normal hepatic parenchyma. The representative digital subtraction angiography of the patients with HBV-associated ICC who received TACE. All patients who received postoperative TACE were due to early local recurrence of the tumor and all these patients demonstrated relatively abundant blood supply of tumor compared with others that the blood supply to the tumor was less abundant. TACE was performed by an injection containing a mixture of chemotherapeutic agents with lipiodol followed by embolization with polyvinyl alcohol or gelatin foam up to complete stasis was attained in the tumor-feeding vessels. For the chemotherapeutic agents, epirubicin, cisplatin, and fluorouracil were concurrently used. All patients who received postoperative TACE were due to early recurrence of the tumor (Figure 1). The variables were described with median (minimum to maximum) values. Non-parametric test and χ2 tests were used for the statistical analyses of the data. Survival curves were made using Kaplan-Meier method, and statistical differences in survival outcomes were calculated using the log rank test. Univariate and multivariate analyses were carried out by using the Cox proportional hazards model. All analyses were performed using SPSS 19.0 (Chicago, IL). P values of less than 0.05 were regarded statistically significant. There were 28 male patients and 14 female patients with a median age of 54 (35-77). Among them, 15 patients (35.7%) were complicated with liver cirrhosis (Table 1). Median size of the primary tumor was 6.5 cm in a range from 2.0 cm to 18.0 cm. A majority of patients (85.7%) possessed single tumor. Nine patients underwent TACE after hepatic resection. Vascular invasion and lymph node metastasis was detected in 16 (38.1%) and 15 (35.7%) patients, respectively. HBsAg was positive in 29 patients (69.0%). Median level for preoperative AFP and CA19-9 was 5.05 (1.25-3000) and 47 (10-8144), respectively. Among 42 cases, only 24 cases were available of preoperative CT scan-related data due to retrospective nature of the study, and 15 patients (62.5%) demonstrated APE (Figure 2). TACE was performed in 9 patients who demonstrated early recurrence of the tumor; the definition for the early recurrence included both detection of recurrence nodules in CT scans (n = 3) and elevation of serum CA19-9 levels (n = 6) within 12 months after surgery. All patients who received postoperative TACE were seropositive for HBsAg and HBcAb (Table 2). Among them, 4 patients demonstrated elevation of AFP and serum level of CA19-9 elevated in 5 patients. A total of 2 and 3 patients presented with lymph node metastasis and vascular invasion at the time of hepatic resection, respectively. Median size of the tumors was 9 cm (range, 2.5 to 16). All patients who received postoperative TACE demonstrated hepatic APE in preoperative CT scans. The representative expression of the tumor at arterial phase of CT scans in patients with HBV-associated ICC with abundant blood supply. Shown is the representative HBV-associated ICC with abundant blood supply to the tumor. Obvious enhancement was found within and around the tumor (Middle left side) at arterial phase of CT scans in patients with HBV-associated ICC with abundant bloody supply to the tumor. All baseline and serological characteristics were analyzed to identify prognostic factors of HBV-associated ICC for the OS. Tumor size > 5 cm (HR, 4.682; 95% CI, 1.092 to 20.074; P = 0.022), TACE (HR, 0.239; 95% CI, 0.055 to 1.039; P = 0.039), AJCC stage 3 and 4 (HR, 6.370; 95% CI, 2.420 to 16.770; P < 0.001), lymph node metastasis (HR, 3.968; 95% CI, 1.654 to 9.521; P = 0.001), and CA19-9 > 35 kU/L (HR, 2.968; 95% CI, 1.000 to 8.809; P = 0.040) revealed to be significantly associated with survival outcomes (Table 3). In the multivariate analysis, tumor size > 5 cm (HR, 5.654; 95% CI, 1.175 - 27.204; P = 0.031), TACE (HR, 0.123; 95% CI, 0.023 - 0.643; P = 0.013), and lymph node metastasis (HR, 3.284; 95% CI, 1.236 - 8.724; P = 0.017) remained statistically significant (Table 3). Among patients who received TACE, only 1 patient, who had 12 cm of primary tumor and lymph node metastasis at the time of surgery, died of hepatic recurrence within 1 year after surgical operation (Figure 3A). The second patient, who also had lymph node metastasis at the time of surgery, in the TACE group died at 18th month after surgery. The other patients survived until the last follow-up investigation. The OS of the patients in the TACE group demonstrated significantly prolonged survival outcomes (1-yr, 88.9%; 3-yr, 77.8%; 5-yr, 66.7%), compared to the non-TACE group (1-yr, 63.6%; 3-yr, 30.8%; 5-yr, 13%). In the subgroup analysis of patients with CT scan data, TACE also revealed to be a favorable independent prognostic factor that significantly improved the OS (HR, 0.105; 95% CI, 0.014 to 0.774; P = 0.027; Table 4). APE showed no significant impact on OS of the patients with HBV-associated ICC (P = 0.179; Figure 3B). However, the OS of the patients with APE was relatively higher than the patients without APE without statistical significance (1-yr, 73.3% vs. 66.7%; 5-yr, 26.7% vs. 11.1%). Furthermore, when compared patients who received TACE and patients with APE who did not receive TACE, no statistical significance was found (P = 0.074). However, there was a trend indicating the difference has a potential to be statistically significant if the number of patients is enlarged (Figure 3C). In the univariate and multivariate analysis, APE could not independently and significantly predict the OS of patients with HBV-associated ICC (HR, 0.435; 95% CI, 0.140 to 1.359; P = 0.141; Table 4). Survival outcomes of the patients with HBV-associated ICC who received TACE and demonstrated APE. Shown is the prognostic impact of TACE and APE on overall survival of the patients with HBV-associated ICC. Significantly better survival outcomes were observed in the patients who received postoperative TACE compared to the others (5-yr OS, 44.4% vs. 9.1%; P = 0.037; Panel A). APE was found to be not statistically significant on prognosis of the patients (P = 0.179; Panel B). In addition, OS of patients who received TACE and patients with APE who did not receive TACE was found to be relatively better without statistical significance, which has a potential to be statistically significant when the number of patients is increased (5-yr OS, 66.7% vs. 0%; P = 0.074; Panel C). Patients with HBV-associated ICC who received TACE after hepatic resection (n = 9). Univariate and multivariate analyses of variables that significantly affected the OS of the patients with HBV-associated ICC (n = 42). HBV infection has been identified to be a risk factor for the incidence of ICC for a decade [9-11]. Subsequently, several studies have evaluated association between HBV infection and prognosis of ICC [12-19]. Most of the studies demonstrated HBV infection to be a favorable prognostic factor that significantly prolonged OS and RFS of patients with ICC. In addition, a recent meta-analysis indicated that HBV infection significantly improved survival outcomes of patients with ICC . However, a recent publication by Ahn et al. suggested that patients with HBV-associated ICC showed favorable pathologic features due to earlier time at diagnosis of ICC, but their survival outcomes revealed no significant difference. More recently, Wei et al. demonstrated that HBV infection was found to have non-specific association with ICC. Although a majority of studies regarding prognosis of HBV-associated ICC have indicated that HBV infection is a favorable prognostic factor that improves survival outcomes, evidences elucidating the non-specific association remains unclear. In the present study, our results revealed that the performance of postoperative TACE was found to be the independent factor that significantly improved the OS, suggesting that performance of postoperative TACE could be indicated for patients with HBV-associated ICC with enhancement at arterial phase of CT scan to effectively treat local recurrence of the tumor. According to one of our previous studies, HBV-associated ICC demonstrated distinctive clinical, pathological, and prognostic characteristics compared to ICC without HBV infection. HBV-associated ICC demonstrated relatively younger age, high male distribution, high incidence of cirrhosis and tumor encapsulation, poor tumor differentiation, infrequent lymph node metastasis, low seropositivity for CA19-9, frequent elevation of serum AFP and aspartate transaminase, longer prothrombin time, and frequent microvascular invasion . In addition, we most recently confirmed that the presence of HBV infection is a favorable prognostic factor that significantly reduced recurrence rate after hepatic resection and the application of HBV infection could acceptably predict the RFS (concordance index: 0.65) in patients with ICC . Therefore, we suggest that HBV-associated ICC is a less aggressive type of ICC according to relatively infrequent recurrence, without specific treatment procedures that were introduced previously. In the present study, to support future studies to establish curative therapeutic procedures for this group of patients, prognostic factors that significantly affected survival outcomes were identified, including tumor size, lymph node metastasis, level of CA19-9, and performance of postoperative TACE. Previously, most patients with advanced ICC who received palliative treatment have been reported to die within 1 year after treatment . Among the palliative treatments, TACE is the most frequently performed therapeutic approach for patients with unresectable ICC . In addition, TACE has been introduced to exclusively target hepatocellular carcinoma with high extent of neovascularization. Consequently, TACE was considered applicable and efficient for other types of hypervascular hepatic tumors as well. In order to maintain high chemotherapeutic concentration in the tumor location, an embolizing agent is administered in the hepatic artery after chemo and contrast agents are injected . Although extent of neovascularization was not studied, we suggest that HBV infection might promote neovascularization of ICC, thereby induces sensitive response to TACE in patients with HBV-associated ICC. Future studies regarding impact of HBV infection on extent of neovascularization in ICC are needed to confirm our hypothesis. Enhancement at arterial phase is the representative feature of hepatocellular carcinoma in CT scans, as well as an indicative value for TACE . According to the results from the present study, patients who received TACE often demonstrated APE, which participated in misdiagnosing the tumor to be hepatocellular carcinoma, and led to the application of TACE as a postoperative management to control early local recurrence of ICC. 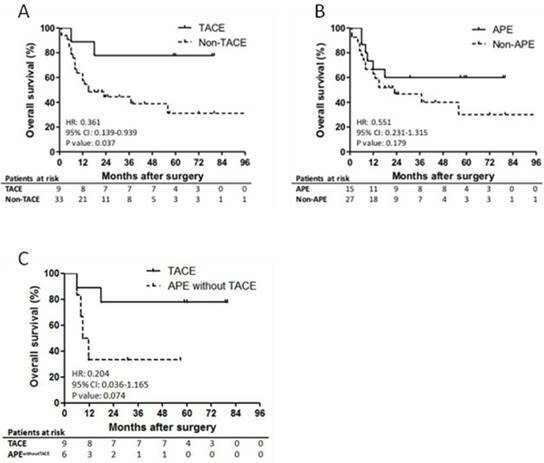 As a result, this group of patients benefited from the TACE treatment and obtained significantly better survival outcomes than the patients who did not receive TACE after early local recurrence of the tumor. Therefore, since enhancement in arterial phase on CT scans is an obvious sign for rich blood supply to the tumor, we suggest that TACE could be applied in patients with HBV-associated ICC of rich blood supply to the tumor for both therapeutic approach to treat early recurrence of the tumor and to prevent local recurrence of the tumor . Although our result is an initial evaluation on efficacy of TACE in patients with HBV-associated ICC, there are a few limitations to be resolved. First, a limited number of enrolled patients might be a weakness of the present study. Second, information regarding CT scans were not completely obtained due to retrospective nature of the study. Finally, biological mechanisms to support this phenomenon were not investigated. Despite above underlying limitations, our study provides a new insight that TACE might substantially improve prognosis of HBV-associated ICC with arterial enhancement in CT scan. In conclusion, performance of TACE significantly prolonged survival outcomes of the patients with HBV-associated ICC. As a preoperative evaluation, enhancement at arterial phase in CT scans needs to be included in order to decide individualized postoperative management. TACE could be a potential favorable approach to control early recurrence and to prevent local recurrence after surgical resection. For our results to be applied in clinical medicine, our findings need to be validated by large-sized clinical trials. Corresponding authors: Jinyang Gu and Qiang Xia, Department of Liver Surgery, Renji Hospital, School of Medicine, Shanghai Jiao Tong University, Dongfang Road, NO. 1630, Shanghai 200127, China. Email: gjynydcom (Jinyang Gu) and xiaqiangedu.cn (Qiang Xia). Tel: +86 21 68383775. Bureau (2012ZYJB0001), and the Technological Innovation and Action Project of Shanghai Science and Technology Commission (15411950401).